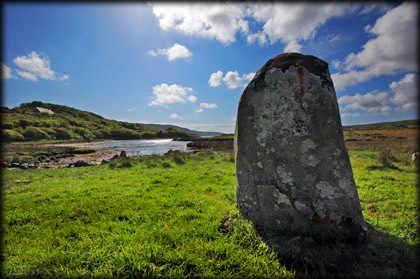 This stone is situated on a flood plain at the end of Streamstown bay. If I was trying to sell this stone to someone, it would be all about "Location, Location, Location"; it really is that beautiful here. 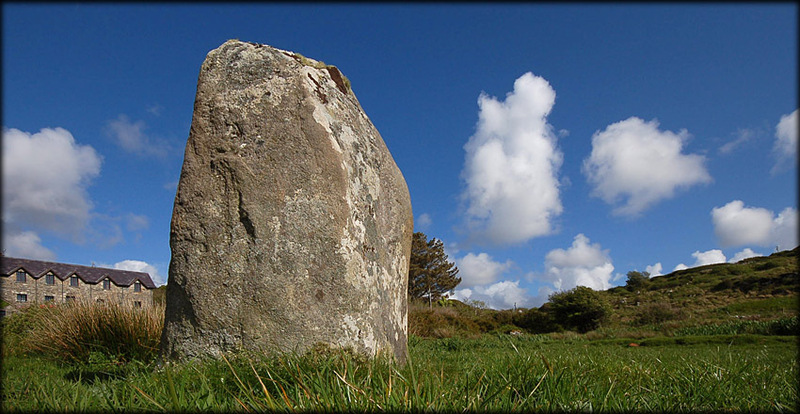 The granite stone is over 1.5 metres high and very round in appearance. You can see the lovely texture of the granite in the image above. There are a number of megaliths in this vicinity so it is well worth keeping some spare time to explore this beautiful area. Situated: From Clifden take the N59 north west towards Cleggan. After 2 kilometres take a left at Letterdeen. At the T-Junction take a left and park up. The stone can be seen in the field to your right. Discovery Map 37: L 6462 5262. Last visit May 2009.